Put aside for a moment that this book is about a specific model, possibly a car or type of car you may not have the remotest interest in. You’ll want to know about the book anyway because, as far as car books go, this one is so well presented that it’s in a class all its own. Evolved from the Fiat Topolino of the 1930s, the Nuova 500 (1957–1975) continued a tradition of cheap and practical small-displacement passenger and utility cars of the sort favored by European tax systems. Both of these Fiats, and many others, sprang from the mind of Dante Giacosa (1905–1996) who had joined Fiat’s aero engine division fresh out of military service in 1928. 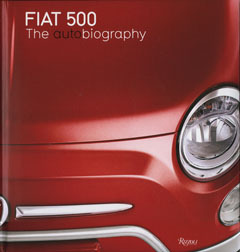 In 2007, the 50th anniversary of the original 500’s launch, Fiat revived the nameplate. Thanks to a 2010 merger with Chrysler, the 500 is as of March 2011 also available in the US but due to a problematic distribution network still has not nearly become the runaway success that was predicted. If the book was meant to coincide with the US launch it is not clear why it was first published that year in Italian and only came, translated, to US bookshelves a year later. This book should have been simple enough to review . . . lots of images, little text, easy topic. But the way it goes about its business is what defies analytical thought. 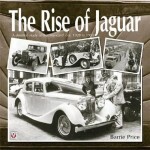 Not because it is fluff, far from it, but because it is not a conventional car book, not written by conventional car people, not historical, not technical, not a critical appraisal, not concerned with making any particular point. It just is, all sunshine and light. If one had to categorize it you might call it a love letter to a car, or about a car. It begins with the cover—a padded affair, like you would find on a children’s book. 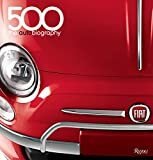 If you open both front and back cover at the same time, you’d see the whole front of the new 500, with the chrome strip and the FIAT logo on the hood neatly falling on the spine. A quick first look reveals splashy type, wild layouts, color/color/color, old ads, new ads. The Table of Contents doesn’t show half the tidbits the book contains (nor is there an Index) but it does enumerate several short essays by named authors. Nothing is said about who these “names” are, nor the person to whom the rest of the text is attributed, Lorenzo Ardizio. Good thing we SpeedReaders know a thing or two, so we can enlighten you. 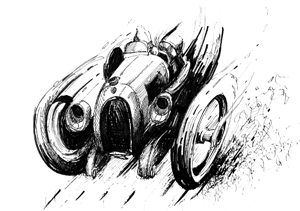 Ardizio, who has several car books with a design twist to his name, is associated with automotive design courses at the Scuola Politecnica di Design, a hub for Italian design pretty much right from its founding in 1954 by painter and sculptor Nino di Salvatore. Another named writer is Frida Giannini (b. 1972), a fashion designer who moved from Fendi to Gucci where since 2006 she is Creative Director for the entire label. (There is a Gucci edition of this car.) Ron Arad (b. 1951) is an Israeli industrial designer, artist, and architect. Book people ought to recognize him as the designer of the undulating Bookworm bookshelf (1994). He was Head of Design Products Department at the Royal College of Art from 1997 to 2009. Ugo Nespolo (b. 1941) is an Italian painter, sculptor, and experimental filmmaker known for his artistic collaborations across the advertising, theater, and literature genres. Vittorio Zucconi (b. 1944) is an Italian journalist and author who currently serves as the US correspondent for La Repubblica with a side gig teaching graduate classes on Italian history and journalism at Middlebury College in Vermont. In other words, these folks are cultural activists and commentators. And the fact that they take this car and its place in the world seriously is meant to show that the 500—old and new—is among the few that have become cultural touchstones, icons of a lifestyle, a way of living, a statement, and specifically an Italian statement. 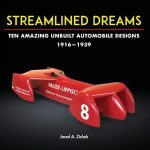 Subtitled an “autobiography” the book is an unreservedly positive homage to the car, explaining its origins in the spread of mobility in prewar Italy, its design and technical parameters, and different models, specials, and design studies. A particularly telling illustration is a profile of the old car overlaid with the new one, showing that the current 500—small as it may be—is significantly larger in every dimension. 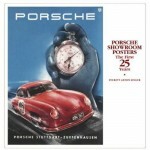 The story ends with the US launch that at the time of writing was still to come. If you own the car, want the car, know someone who does, or just want to enjoy a really pretty and cleverly made book, you’ll get a lot of enjoyment out of this one. If you’re single-mindedly on the “just the facts” track, this book probably won’t ring your bell—but then you’d probably not be a Fiat 500 person in the first place.